Buy two pairs of jeans and get 30% off. Or, use code FRIENDSFIRST online for 50% off a $250 or more purchase, and 40% off $125 and up. I love Levi's pullovers (see below). Also, kids and baby online is up to 40% off! 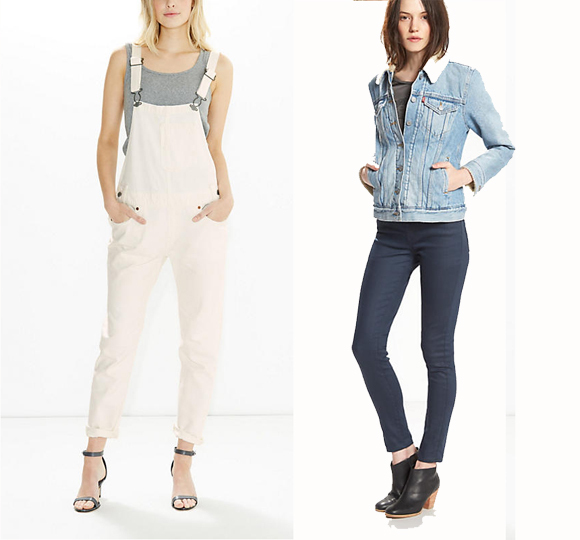 All around a fabulous time to shop Levi's, especially if you want really, really cute white ("winter bloom") overalls. NEED. Inspired by Havana, the Hanley Mellon husband/wife duo cranked out a show full of fun, unexpected prints and truly delightful, wearable separates. It's refreshing to view during fashion week a whole collection of colorful sportswear with a hip twist (see head scarves, pointed-toe buckle boots paired with everything). Long, sleeveless tunics, short flirty skirts, and a group of cool whites make Hanley Mellon a go-to for work and play. Highlights included side-wrapped bronze pants paired with a long checked jacket, and the overall modern '70s vibe with a Cuban twist, neither of which, thank goodness, were taken too far. Just right perfectly sums up this breezy and covet-able collection. 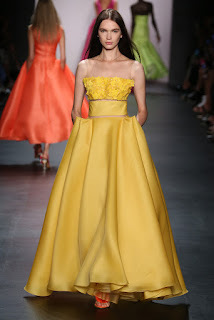 Angel Sanchez presented a collection of evening gowns and jumpsuits in a variety of bright colors and contemporary shapes. His background in architecture was evident through the designs geometric cuts and the futuristic materials gave way to a distinctly modern feel. 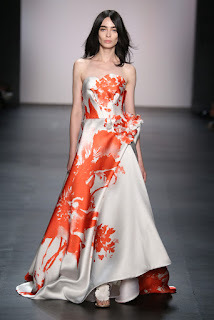 Sanchez was able to keep the collection feminine and fun with lighter than air dresses in bright tropical colors, including yellow, pink and orange, and large floral patterns. The light materials screamed spring and hand-cut flowers clustered around the wait and necklines were an interesting way to incorporate detail. While any woman would love to get their hands on any piece, my favorite look was the black crinkle organza ballgown. 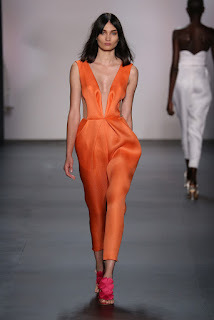 In a close second was the orange jumpsuit, perfect for any big night out. Inspired by “nomadic wandering through the Mojave Desert,” the Skingraft collection designed by Jonny Cota evoked a sense of strong, self-reliance. The garments were displayed on 12 models, standing statuesquely in two rows on a dark stage at the side of the showroom. The looks were utilitarian, with pockets, pouches, and parachute drawcords, all adding to a sort-of warrior aesthetic. However, the clothes were not overwhelmed by these extravagant embellishments; rather the collection as a whole was tied together through this mix of function and fashion. Usually, orange is the number one color I avoid in my wardrobe, and if I dared to be wearing the hue, I certainly wouldn’t pair it with black to avoid that Halloween look. So how does Francesca Liberatore get it so right? Whether it’s her choice of fabrics or print, she manages to strike the perfect balance to make it work. Her Spring / Summer 16 collection is full of stunning silk chiffon dresses, with sheer, embroidered, and printed details of the heart. To down play the femininity, models walked down the runway barefoot, with slightly mussed hair, covered with silver paint strokes. I also enjoyed her more tailored menswear inspired vests and coats. It’s been a privilege watching Son Jung Wan develop as a designer over the past few seasons for Fashion Week. 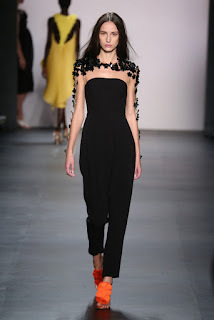 Her collection showed that she has really figured out her brand and her target audience – and who better to represent her classically elegant style than front row supporter Kelly Rutherford. Inspired by Jeju Island in Korea, Wan aimed to translate its scenic beauty into her clothes, from the turquoise color of sea, or pastel pinks and lilac of florals. I love the structure of her clothing; she achieves angles and shapes different than any other designer through interesting cuts and truly understanding movement. Lie Sang Bong’s Spring 2015 collection felt like the future. Everything was crisp and white, blue or black. 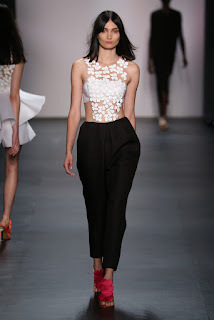 There were lots of transparent cut-outs rendered in sharp-angles and mesh. All models wore the same white or black caged mules. The stitching, where visible, was oversized. Even the setting was futuristic and larger than life, with giant dandelions on both sides of the runway forecasting a time when plants overtake humans. Walking into Skylight Clarkson Square, the venue space felt raw, strikingly different than the tents of Lincoln Center. As a venue, it has transformable potential with the ability to adapt to a variety of events. Dull grey carpeting as we entered didn’t exactly convey a glamorous feel, but The Gallery space itself was well presented. Idan Cohen's presentation followed the trend of a more modern runway experience, with the models parading down the main runway, then looping back down the two “side” runways. Paired with upbeat music, and long beachy waves, Idan's gowns moved fluidly down the runway in pastel tones inspired by the sand and sea. 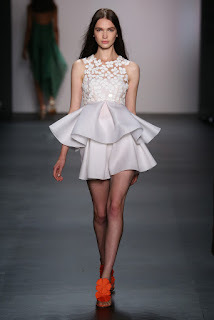 Standout pieces include the gorgeous finale gown, and sparkly rompers layered with satin overcoats. 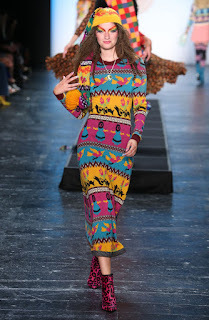 It’s safe to say Betsey Johnson is a woman who is not afraid of color. This year marked her 50th anniversary as a designer, and what better way to celebrate than throwing a party on the stage at NYFW. Carefully curated, and cleverly titled The Curious Case of Betsey Johnson, the collection was tailored to reflect Betsey's 50 years in the industry, separated by the signature look of each decade, playfully taking us on a trip down memory lane. 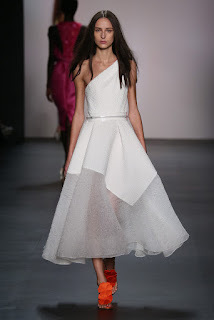 Starting with Limelight, we saw dresses from every little girl's ideal dress-up closet - brightly colored, glitzy tutus, flouncy skirts and colored fishnets. 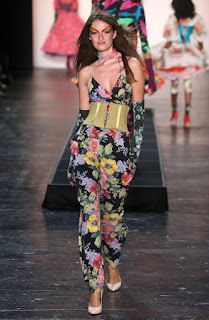 Next, Palladium featured bold prints, layered corsets, jumpsuits, colorful socks and elbow length printed gloves. Bringing us into the punk rock attitude of the 80s, we get interrupted with Mud Club and edgy looks, plaid, pinstripe suits, and a black vinyl dresses. Naturally progressing followed Electric Circus, or the hippy inspired 70’s, featuring eclectic knitwear, some even doubling as pajamas. If I had to self title these looks, I would say “Granny Chic", including one of my favorite pieces, a long knit dress with matching nightcap. While many over the top looks were not ready to wear for everyday women, Max’s Kansas City, was ready to be worn off the runway. The 60’s collection featured simplistic mod dresses and Twiggy inspired looks, complete with the era's signature beehive. Betsey ended her journey with a collection titled Ann K. Pimm, a tribute to her childhood dance instructor. 50’s inspired leotards, pin up costumes, and dance attire was the perfect finale. Her narration throughout the show tied the presentation together, and she closed with her signature cartwheel and split. Despite a flurry of coordinators herding photographers into place and black clad interns showing guests to their seats, a thirty minute delay forced guests to occupy themselves until the models took to the runway. Though Karigam started slow, it was well worth the wait, finishing with a flourish. Designer Karina Gamez showcased an elegant collection, perfect for the strong, sophisticated, metropolitan woman. Luxurious overcoats, dresses with zipper and sheer details, high collared shirts, tailored and structured workwear, evoked a crisp yet futuristic image. Her palette was limited largely to black and white, with a touch of pink or beige. MUST have one of her flowing hooded trench coats for spring.